For the first time in human history, more than half of the world’s population lives in cities, a shift that is resulting in new challenges. 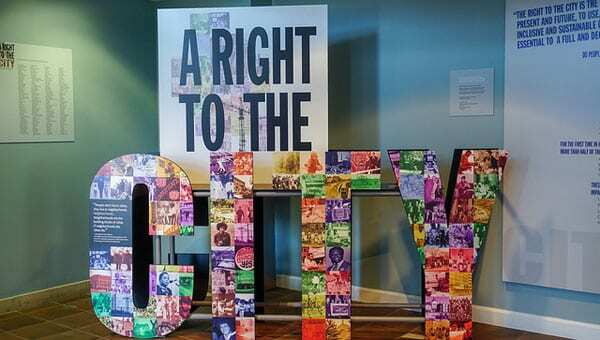 The Smithsonian Institution’s Anacostia Community Museum, with its 50th anniversary exhibition, A Right to The City, addresses many of these in the context of its home city of Washington, DC. In his introduction, Meghelli emphasized the rapid recent growth of Washington, including an estimated 1,000 people moving to the city per month, and its related population shifts—including the loss of the designation of being a majority-Black city. Within this context, Meghelli asked, “How do communities mobilize locally and globally to ensure their preservation?” Citing examples from the past and the present, panelists including scholars, activists and nonprofit leaders from all over the country explored this question. Broadening this discussion, Kimberly Johnson, professor of cultural and social analysis at New York University, noted that like Washington, cities such as Chicago, Dallas, and San Francisco had lost Black population in recent years. Johnson’s current research focuses on this issue of shrinking “chocolate cities” with specific emphasis on population shifts in Oakland and Newark and the impact on local and national politics. Johnson noted that when Blacks move to the suburbs, they often become fragmented. As a scholar, Johnson is acutely aware of the lack of “urban endowments” that remain in these cities after population shifts, which have adverse effects on local entities, such as parks and schools. Nancy Raquel Mirabal, who directs the US Latina/o Studies Program at the University of Maryland at College Park, conducted a ten-year oral history project of Latinx displacement in San Francisco. Mirabal explained that in San Francisco, as in Washington, development had often led to displacement of communities of color, particularly after the opening of Bay Area Rapid Transit, better known as BART. According to Mirabal, when BART first opened in the early 1970s, the concept of “mobile bodies of color” was contentious and whites feared transit lines that increased mobility of residents of color. But in San Francisco, as in many cities, gentrification has followed transit-line development. Today, many San Franciscans fear that the Mission District, long the cultural heart of the city’s Latinx community, may be disappearing; a 2015 city report documented that the Mission was no longer majority Latinx and the proportion of Latinx residents was projected to continue to fall in the coming decade. Gregory D. Squires, a sociologist at George Washington University, noted that institutions of higher education are economic assets but that cities often don’t know how best to use them. Rather than letting land surrounding a campus deteriorate so that it can be purchased, participants wondered how a community can work with universities as partners. Rosemary Ndubuizu, who teaches African American Studies at Georgetown, invited participants to imagine that they truly had a right to their city. “Imagine a DC, with housing to suit all and a family-friendly park that gives special recognition to women of the past such as community activists Hallie Patterson and Etta Horn with a memorial pond.” Ndubuizu’s current work looks at how housing policies are shaped by race, gender, political economy, and ideology. She has a special interest in how low-income Black women have been affected by changes in public and affordable housing policies and advocacy. She explained that even with Washington’s strong history of activism, developers have often won out. But she added that a “mosaic of nonprofits” have helped residents hold on to some gains. Amanda Huron, who teaches interdisciplinary social sciences at the University of the District of Columbia, spoke about her work in the areas of affordable housing and tenant organizing within a historical context. She explained that the year 1974, when DC gained home rule, was a turning point for the city that led to the City Council strengthening housing laws to reinforce tenants’ rights. Huron noted that since that legislation, many rent strikes and co-op purchases throughout the city have been led by “African American and brown women” in gentrifying areas. She highlighted that while this is most often unrecognized work in terms of the city at large, these types of protests serve as an important way to reclaim ownership of the city. Diane Wong, assistant professor and faculty fellow in the Gallatin School at New York University, focuses on intergenerational resistance to gentrification in Chinatown districts in New York, San Francisco, and Boston. Wong notes that the percentage of Chinese-Americans living in Chinatown districts has declined nationally. As a result, a dominant narrative focuses on the issue of leaving. Wong is active with the WOW Project, which aims to sustain ownership over New York City’s Chinatown by growing, protecting and preserving its creative culture through arts, culture and activism. Wong explained that because terms like “gentrification” do not exist in Mandarin or in many other languages, the WOW Project’s goal of creating space for conversations to happen across language barriers and generational gaps becomes even more important. Wong added that in New York City just as in other places, the history of organizing is contrasted with a history of global capital moving in along with co-ethnic exploitation. One last section of the A Right to The City exhibition features Anacostia, where the Anacostia Community Museum is based and a community that has often lain at the heart of Black activism in Washington. In the 1960s, with the civil rights movement building nationwide and economic inequality heightened locally, a local Anacostia nonprofit, the Southeast Neighborhood House, a social service organization founded in 1929, helped spawn two important community groups: the Rebels With a Cause, a youth organization that advocated for recreation centers and improved infrastructure, and the Band of Angels, a group of self-proclaimed “welfare mothers” who fought for tenants’ rights. Looking ahead, speakers emphasized the importance of establishing stronger linkages within neighborhoods between services provided by local governments, nonprofits, and residents. Participants were left with questions about what truly “family-friendly” public housing might look like and how legislation within cities might do a better job of supporting local businesses so residents of Anacostia and other communities can stay in place while still benefiting from increased availability of goods and services in their neighborhoods. In coming months, the museum plans to build on these conversations—both through a new bimonthly discussion series at the museum and pop-up venues, and through a partnership with We Act Radio, an Anacostia radio station that will broadcast a weekly series on “Gentrification or Displacement,” hosted by Joseph Young, who participated in the symposium. Riding a wave of popularity, Comic-Con International will create a museum in its home base of San Diego to provide a year-round educational center dedicated to the popular arts.